From past decade, the automotive sector is growing with fast pace. Growing focus of automotive manufacturers for improvement of automotive and innovations such as electric vehicles which are fuelling growth of the automotive battery market. Additionally, growing exploring activities on electric or plug-in hybrid vehicles owing to growing prices of fuel coupled with growing awareness about environment. These factors are fuelling research activities for improvement of battery support which is propelling growth of the global automotive battery market. Owing to the promising opportunities in present in the electric vehicles, OEMs of automotive are trying to introduce new and hybrid and electric car models. Additionally, these OEMs are trying to develop large automotive in order to accomplish need for electricity-based transportation and other similar requirements. Additionally, numerous governments are imposing strict regulations in order to reduce the carbon emission which is supporting growth of the global automotive battery market. However, additional cost of manufacturing the battery is limiting some players to explore and start production of the electric vehicles which is restraining growth of the global automotive battery market to some extent. Nonetheless, growing research and exploration of supportive material can lead to launch of an advanced product which is likely to offer lucrative opportunities for the key players operating in the automotive battery market. According to a report TMR, the global automotive battery market is projected to be worth US$54.5 bn by the end of the forecast period and is expected to expand with healthy CAGR of 5.70% CAGR over the forecast period from 2017 - 2022. On the basis of the vehicle type, the global automotive battery market is segmented into a compact, mid-sized, premium, luxury, commercial, and heavy commercial. On the basis of the sales channel, the global automotive battery market is segmented into OEM and aftermarket. On the basis of region, the global automotive battery market is segmented into North America, Europe, Asia Pacific, Latin America, and the Middle East and Africa. Of these, Europe dominated the global market for automotive battery with dominant share. This growth in the market is attributable to the presence of a large number of automobile companies coupled with growing investment in the field. However, the emerging economies in Asia Pacific are offering lucrative opportunities in the overall market. Additionally, growth in the North America region is expected to witness steady growth in the upcoming years. Some of the key players operating in the automotive battery market are Leoch International Tech, Furukawa Electric Co. Ltd., Hitachi Ltd., Haldex Incorporated, and Exide Industries Limited. The global market for automotive battery has highly competitive and expected to further intensify competition over the forecast period. These key players are making efforts to expand product portfolio through merger and acquisitions. In addition, growing research and development (R&D) activities for development of automotive battery are leading to launch new products over the forecast period. Transparency Market Research (PMR) offers an exclusive study on the global market for automotive batteries. The report is comprehensive and insightful, wherein a slew of factors influencing the dynamics of global automotive battery market have been analyzed. For generating accurate forecast on the global automotive battery market for the five-year period (2017-2022), revenues from key market participants for the past five years have been aggregated as a baseline to derive market size estimations. By availing this report, players in the global market for automotive batteries can avoid the undertaking of heavy in-house research on how the market will expand in the near future. Through the inferences offered in this report, the market players will be enabled to take informed decisions and create credible strategies towards expansion of their presence in the overall automotive battery market. The report is compiled by considering a robust study structure that provides detailed analysis and forecast on the global automotive battery market in a chronological manner. Executive summary in the report provides a concise outline on key findings offered in the report, with a particular focus on revealing regional forecast on the global automotive battery market. 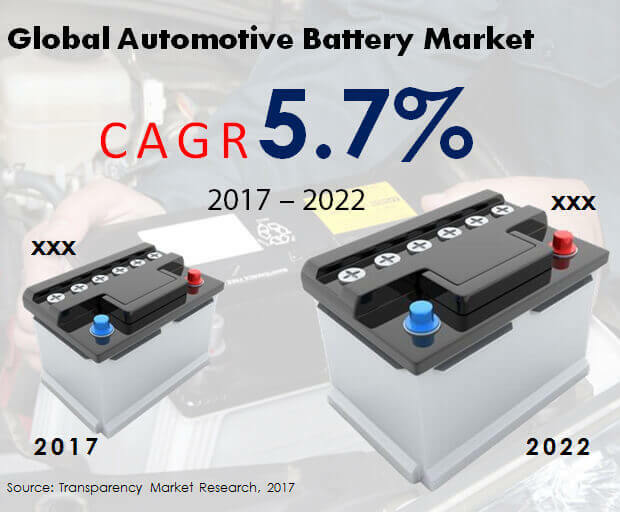 The overview of the report delivers market introduction, a standard definition to automotive battery, and forecast estimations in Year-on-Year (Y-o-Y) growth rate metrics. The report covers all key aspects influencing the growth of global automotive battery market in a section focused on market dynamics. This section provides a technology roadmap based on the prospects for manufacturing of automotive batteries till date. The section also provides analysis on automotive production across multiple regions, the diversity in global sales of automobile parts such as batteries, and their distribution network. The report also offers an intensity map that plots the presence of key market players in several regional automotive battery markets across the globe. Key sections in the report deliver segmented analysis on the forecasted expansion of the global automotive battery market. The report has analyzed the global automotive battery market on the basis of type of chemical composition, vehicle type, sales channel, and region. Additional information on cross-segmental analysis and country-specific forecast on automotive battery market has also been provided in the report. The report has also profiled key players in the global automotive battery market, in a section focused on competition landscape. Based on their current market standings and key undertakings, companies participating in the global automotive battery market have been analyzed for understanding key competitors in the market for the approaching years. Our team of analysts and subject matter experts have developed this report by employing a range of research approaches, creating a reliable methodology for analyzing and forecasting the global automotive battery market. Qualitative insights offered in the report have been infused with quantitative estimations to boost the accuracy of market size forecasts being provided. The segmental and overall market size estimations have been interpreted through metrics such as compound annual growth rate (CAGR), revenue share, absolute dollar opportunities, and Basis Point Share (BPS) index. The report serves as a credible business document for automotive battery manufacturers seeking high-quality and dependable research study on how the overall market will expand in the near future. The scope of the report is to enable these players towards creating strategies that help them build stronger footholds across the untapped markets for automotive batteries in the immediate future.